Come and discover the second largest island of the West Indies enjoy Punta Cana at its best, a landscape of endless palm trees and heavenly beaches with crystal clear water and white sand. Located in Playa de Punta Cana, Dominican Republic, the Hotel Riu Palace Punta Cana offers its guests 5 star service, where everything is at your fingertips. When you are able to get away and escape from the hustle and bustle of your life you’ll find the best options for a complete rest during your vacation at the Palace. It includes a fresh water swimming pool with adjoining whirlpool bath, gym, or relax in the sauna or Jacuzzi at the Eternal Spa. After a long day treat yourself to a range of different treatments and massages either at the spa or directly on the beach in a wooden cabana where you can relax to the sound of the ocean. You can also get a new hair style at the hair salon. 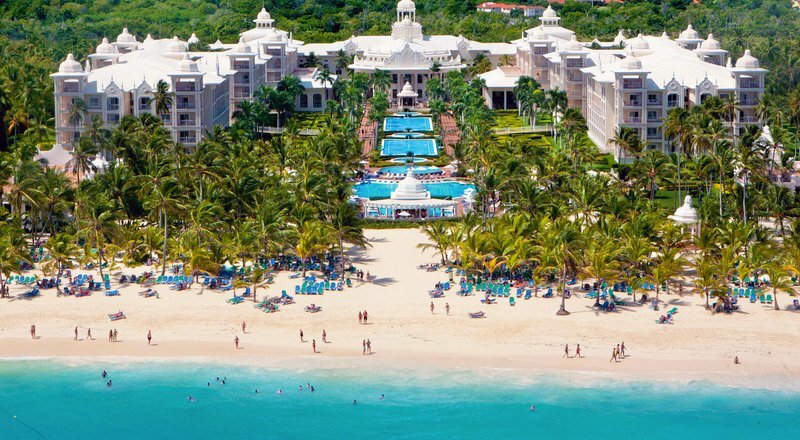 The Hotel Riu Palace Punta Cana is within a Riu Resorts complex of together with the Hotel Riu Palace Bavaro, Hotel Riu Palace Macao, Hotel Riu Bambu and Riu Naiboa, and like all the RIU properties it offers an entertainment program that you can enjoy all day long. The beautiful beach gives you the perfect setting for water activities like sailing, kayaks, windsurfing, snorkeling. If sunbathing is your favorite activity you have the beautiful white sand with the glorious sea in front of you. You can also take a free scuba lesson in the pool. Tennis courts are a short walk and are there for you any time of day. On the RIU grounds is the Caribbean street where you will find shops, billiards, or view the pictures at the photo shop that the professional photographer took of you. Your kids ages 4-12 will have fun at the Mini-Club during the day where they will make new friends and the staff will have plenty of activities for them. In the evening there will be live music along with RIU themed shows. If you want to try your luck at gambling you can go to the casino at the RIU Macao. 612 Junior suites all are split level with a seating area with a sofa and have a bathroom with a hydro massage bathtub, safe, fully filled min-bar and liquor dispenser, free Wi-Fi and a balcony or patio. Room service is available 24 hours a day along with 6 restaurants and five bars. You have your chose of the following: “Don Manuel” restaurant (non-smoking) with terrace, “La Bodega” Brazilian restaurant (non-smoking), “Krystal” Fusion restaurant (non-smoking), “Yokohama” Japanese restaurant (non-smoking), “Luigi” Italian restaurant (non-smoking), “La Altagracia” poolside restaurant – grill and steakhouse, “Perico Chicote” lobby bar,”Los Rosario” lounge bar with terrace, “Saona” poolside bar with swim-up bar, “La Plaza” bar, Sports bar (open 24 hrs, All Inclusive service.